Accommmodation in Mossel Bay: Garden Route Boutique Hotel and Spa. You are here: Home / Western Cape / Mossel Bay / Accommmodation in Mossel Bay: Garden Route Boutique Hotel and Spa. Within the Garden Route lies a hidden treasure yet to be discovered. Situated in the historical town of Mossel Bay on Dias Beach. The ideal stopover between Cape Town (392 km) and Port Elizabeth (396 km). Be entertained from our deck by the hovering acrobats of the Cape Seagulls or in Whale season have the giants of the sea amaze you with their graceful breaching before plunging back into the deep ocean. This Place is Your Tranquil Oasis. There is Treasure all around You. Revel in the Peace and be Pampered. Dream in this Sanctuary and you will be Rejuvenated. And memorable hours will unfold. This heavenly retreat offers sixteen en-suite rooms all overlooking the Indian Ocean. Each room is individually decorated in timeless elegance and luxurious comfort – tailor made perfection. From pure cotton linen to warm towel rails and fully stocked mini – bars…. the Garden Route Boutique Hotel & Spa offers the ideal destination for the discerning guest and companion. For your relaxation indulge in the indoor heated pool or the sauna. Or visit the award winning Day Spa where the art of health and beauty treatments are mastered with professionalism. The Whispering Waves Restaurant which specializes in smart comfort food and an exotic cocktail bar. Enjoy food prepared with passion and reckless abandonment in a romantic setting. 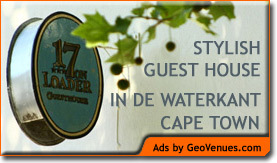 For guest house accommodation in de Waterkant, Cape Town – stay at 17 on Loader Guest House. Click here for more information.